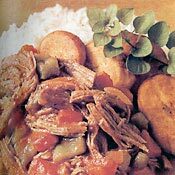 RECIPE TITLE "Cuban Ropa Vieja with Fried Plantains and Rice Recipe"
This Latin recipe, brought to the New World from Spain centuries ago, is like a beef hash with a lot of soul. It is a dish that is common in Central and South America and the Caribbean, and there are many versions; this one is Cuban. There are many theories as to the origin of the name "Ropa Vieja," literally "old clothes." One suggests that the shredded beef resembles rags; another, that leftover beef can be used--a hand-me-down recipe turning old clothes (or beef) into new. Beef for All Seasons Beef for All Seasons, provides a wide range of seasonal recipes using many different cuts of beef, among them beef tenderloin, tournedos, ground beef, short ribs, brisket, carpacio, and pot roast. The incredibly taste-tempting dishes here include Beef Picadillo Tacos de Oaxaca with Rice and Beans, Skewered Beef Satay with Peanut Sauce, James Beard's Roquefort Broiled Steak with Baked Potatoes, and Beef and Guinness Pie with Mushrooms and Chestnuts. TO PREPARE ROPA VIEJA: Place the water, garlic, onions, carrots, celery, jalapenos, peppercorns, juniper berries, thyme, bay leaves, and salt in a large saucepan and bring to a boil. Reduce the heat and simmer for 10 minutes. Add the steak, cover the pan, and cook over low heat for 2 hours or until the beef is tender. Remove the meat and set aside. Let the broth cool. When the beef is cool enough, using your fingers, shred with the grain into 3- or 4-inch lengths and set aside. TO PREPARE SAUCE: Heat the oil in a saucepan, add the garlic and onion, and sauté over medium heat for 2 minutes. Add the oregano, bay leaves, tomato paste, wine, vinegar, 1 cup of the cooled beef broth, and season with salt and pepper. Cook for 10 minutes and then add the bell peppers and shredded beef. Turn down the heat to low and simmer for 15 minutes longer. Remove the bay leaves. TO PREPARE PLANTAINS: Mix together the plantains, mix together the pepper, salt, cumin, and cinnamon in a bowl. Lay the plantain slices on a work surface and sprinkle on one side only with the spice mixture. Heat 1/8 inch of vegetable oil in a sauté pan over medium-high heat and place the plantain slices, spice side down, in the hot oil. Cook for about 2 minutes per side or until golden brown or slightly black. Remove the slices and drain on paper towels. Keep warm. Serve the ropa vieja with about 3 cups of cooked long-grain white rice and garnish with the fried plantains, spice side up. WINE RECOMMENDATION: Food with a Spanish or Latino soul requires the fitting complement-a Spanish Rioja. Italian Bardolino also works well here. HELPFUL TIPS: The rest of the broth in which the beef cooked can be strained and used for stock or as a base for soup (just add fresh vegetables). The plantain recipe is from our good friend Norman Van Aken, owner of the wildly popular and acclaimed restaurant, Norman's, in Coral Gables, Florida. As an alternative to the plantains, serve cooked black beans or another bean recipe that you like. Recipe reprinted by permission of Harper Collins. All rights reserved.